Earlier today, GM Authority was fortunate enough to have visited with the historic millionth Chevrolet Corvette – one of the NCM’s “Great Eight,” which were severely damaged when a sinkhole opened beneath the museum — as it awaits a restoration effort by Chevrolet. The car, in its current state, is pictured above. This particular sinkhole casualty was the fourth car to be extracted from the chasm, and suffered significantly lighter damage than most of its counterparts. Yes, we said significantly lighter. Light enough for Chevrolet to voluntarily restore it, at least. The reason why this irreplaceable milestone of American sportscar history is still looking a bit like it’s been in the maw of a hydraulic compactor is because tackling the car’s restoration necessitates a lot of planning. It comes down to a lot more than just parts and labor; this Corvette is quite literally priceless. At least, so says Corvette Communications Manager Monte Doran. The aim is to keep this vintage relic as meticulously original as possible – quite a difficult task when you take into account all the uniquely-stamped parts. Add to that the fact that, aside from initial observations, nobody truly knows how deep the damage goes until the restoration efforts begin — whether the car starts, where/how extensively the frame may be bent — and that Chevrolet still doesn’t know where (or for some components, how) the restoration process will be performed, and it becomes rather obvious how getting the once-pristine C4 roadster showroom ready once again will pose a significant challenge. But while the road may contain a number of obstacles, and will most certainly be paved with stacks and stacks of GM money, the historical significance of this millionth Corvette warrants such a treatment. It’s the irreplaceable nature of the car that drew Chevrolet into restoring this Corvette in the first place, despite that it is no longer owned by the manufacturer. The rear driver’s side wheel of this 1992 Corvette C4 is toed-out unnaturally – a sign that there is quite likely frame damage in the rear of the car. In addition, the (now flattened) windshield loop forms part of the A-pillars on either side, which run all the way down the depth of the car. This not only suggests some possibility of more unseen bent frame members just ahead of the cabin, but also makes the windshield’s replacement a much more complicated task. 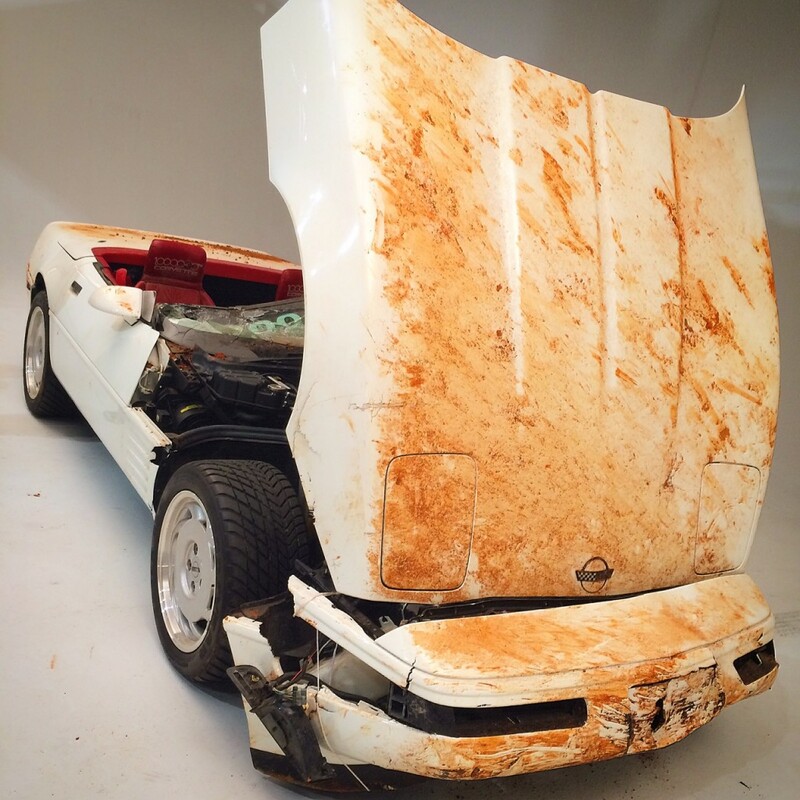 Beyond this, the car doesn’t immediately look to be in such a desperate state – that is, considering the forces of nature at work, which made kindling of so many other classic Corvettes. The top was retracted during the tumble, keeping it likely very intact, and yet the seats, dash, door skins and carpeting look to have seen minimal damage. We will be following the restoration of this legendary one-millionth production Corvette with bated breath.